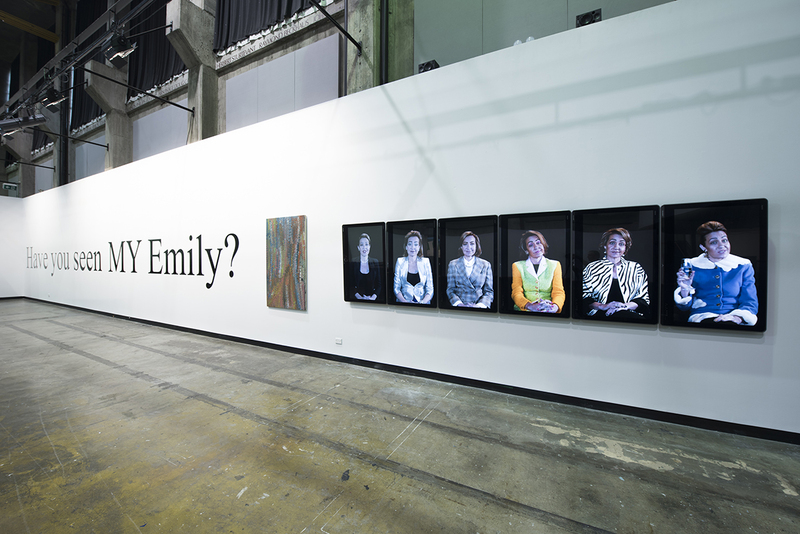 Unmissable from the floor of the main hall of the Casula Powerhouse, the words “Have you seen MY Emily?” stretch grandly the length of a long mezzanine wall. On approach, you find it ends with a painting by Emily Kame Kngwarreye (Untitled, 1994) followed by six vertical video screens — a playful, experimental performative video work by Wiradjuri artist Amala Groom. On each screen a woman speaks directly to you — as her partner in conversation or confidante as she comments on the exchange. It’s like arriving at a party and being rapidly addressed by a succession of eager strangers, six of them, taking turns that require you to shift attention from screen to screen, person to person and from a position of ignorance (especially if you arrive part way through) that requires you to piece together this reconstruction of an unsettling encounter. But this fascinating challenge for the viewer doesn’t stop there. Glasses of champagne in hand, the women are elegantly outfitted and coiffed as discrete individuals — all of them played by Groom. But as the words flow, it dawns on you that three of these women, though differently attired, represent just one — the hostess for a reception — and that the other three are variations on Groom herself, the guest. What you are witnessing is in fact a dialogue but one distributed and multiplied to amplify a sense of party ambience, tension and subsequent reflection. It’s a cleverly immersive and simultaneously disorienting device. 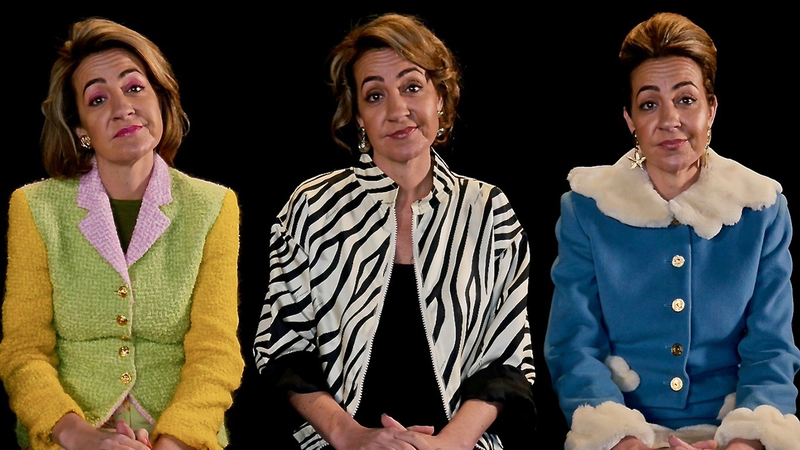 Chorally, Me 1, 2 and 3 announce, “We are me,” and Her 1, 2 and 3, “We are her” and the discussion commences with a “quite robust conversation spanning both religion and politics.” But it quickly falters at the mention of political art, Groom’s writing deftly gear-shifting between speech and reflection with comedic and satirical verve. “Her 1: So what do you do for a job? Me 1: I make political art. Her 2: I need to change the subject. Me 2: I would normally just say I am an artist, but I am provoking this lady into having a semi-uncomfortable conversation with me. Her 3: How do you contribute to the Gross Domestic Product? The discussion grows particularly tense when it turns to the ex-PM’s wife’s proud ownership of the Emily Kame Kngwarreye painting referred to in the work’s title. “Her 1: Have you seen my Emily? Her 2: I own a very expensive painting. Her 3: I cannot pronounce Kngwarreye. Me 1: In the sitting room? Yes, it’s beautiful. Me 2: Did she really just say that? 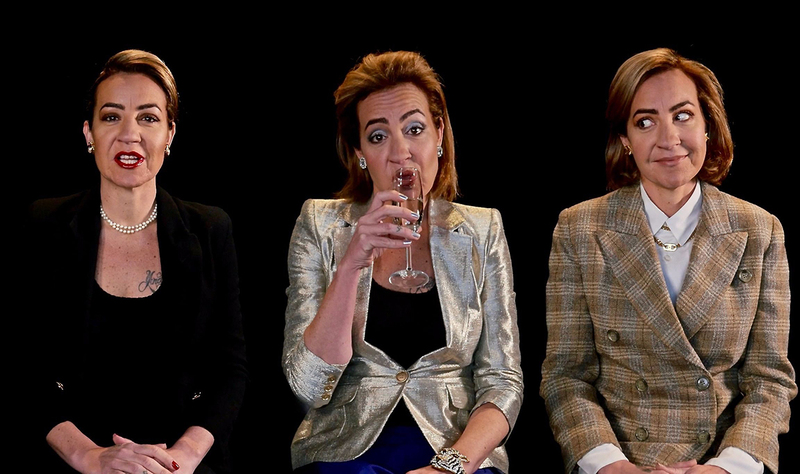 The repetition of “her Emily,” “my Emily” and “Have you seen my Emily?” morphs into a grimly comic litany amid the ex-PM’s wife’s increasingly insensitive utterances. “Her 2: This painting is ‘authentically Aboriginal’ and therefore is an extension of my own personal authenticity. The viewer doesn’t know which of the Hers’ words are actual and which invented, but Groom adopts a tonal strategy that keeps all utterances on a similar plane with a simple vocal realism in which there is no mimicry, no differentiation between voices, little exaggeration, just a gentle flow of casually uttered sentences of largely similar length, the rhythm reinforced with the raising and lowering of champagne glasses. This approach tempers the sheer bluntness of the lines I’ve quoted, allowing them room to correspond with the laid-back, ironically well-mannered demeanour of all the women in this work. It allows us to be amused, shocked here and there and yet contemplative. Have you seen MY Emily? might come from a place of anger (at the ex-PM’s wife’s comments) and it might well engender anger, but Amala Groom has fashioned a seductive video installation that implicates the viewer with face-to-face engagement in a casual conversation which seduces us into becoming attentive listeners and amused observers. One of the most striking characteristics of innovative Indigenous art practice over recent decades has been the extent of artists’ inclusion of images of themselves in their works (Fiona Foley, Christian Thompson, Warwick Thornton, r e a, Tracey Moffatt to name a few working in video), not simply as self-portraiture but as personal statements of connections with country, culture, history and community, as well as satire, as in the video works of Richard Bell. In her first major commission and institutional solo exhibition, Amala Groom has extended this practice with a work that is at once personal, satirical and formally innovative. Amala Groom is a Wiradjuri conceptual artist whose practice, as the performance of her cultural sovereignty, is informed and driven by First Nations epistemologies, ontologies and methodologies and articulated across diverse media. In 2017, Groom’s work has appeared in The Public Body .02, Artspace; System of Objects, National Art School; Moving Histories Future Projections, a dLux Media Arts exhibition toured by Museum & Galleries of NSW, 2016-17; and in Visual Bulk, Hobiennale 2017.